Want to learn more about ficus tree care? Though ficus (or fig) is one of the most popular and favorite bonsai trees and makes excellent first trees for beginners, grasping know-how to take care your ficus will help to gain your goal effectively. Below I’ll show you main tips about ficus tree care. Water – Ficus is not peaky about watering as long as you don’t let the soil completely dry out. This feature make ficus trees a perfect choice for a bonsai novice. You’d better keep the soil moist and the leaves mist by watering the tree every 1-2 days. If that’s not feasible, try to feel the moisture of the soil frequently by, as some sources suggested, sticking your finger about a half of an inch to an inch into the soil. Then, water the tree whenever you feel the soil dry out. Fertilizer - in ficus tree care, sufficient fertilizer is important for their growth, since ficus bonsai are grown in limited soil amounts. Soil – Specially, some of ficus varieties such as Ficus Benjamina can live completely without soil. You can use the root-over-rock method, and soak both the tree and the rock into water. Then you have a gorgeous work of living art on water. 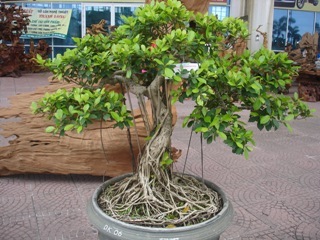 Temperature – Ficus bonsai grows well in tropical and sub-tropical climate, with preferred temperature above 15°C. In regions with chilly winter, the tree should be brought indoors during cold weather days under fluorescent lights to avoid ficus dropping leaves. Humidity – The better the humidity levels are, the more vigorous the plant is. There is a humidity tray available that helps to control humidity and make ficus tree care easier..
Light – Though ficus trees can tolerate extreme differences in light levels as well as temperature variations, it should be given as much light as possible to encourage strong growth. Location - The tree should be placed in a location that receives some bright sunlight during the day, but it should not be in full sun all day long. Besides, you should not position the plant next to heaters, vents or windows that can create widely varied temperatures. Wiring – Wiring works well, however branches do snap quite easily, so take care when bending the branch. The method of clip and grow will also work well on these trees and will give a very pleasing result with lots of character in the branches. They do bud back on old wood very easily and you will need to remove these shoots as necessary, especially the ones growing in the branch forks and other interior branches or trunk. Styling - Figs can be styled in most conventional bonsai styles. However they are especially suited to styles which capitalize on their natural growth habits such as their aerial roots. Root-over-rock styles are particularly popular with figs. All sizes of bonsai can be created with figs but shohin's are best done with the smaller leafed species in order to be most convincing. Repotting – Fig grow quickly and vigorously, both above ground but also in root system under ground. Thus you should remove the tree from its container, inspect and prune its root once a year, and repot every two years, preferably in early spring months. Once the tree has been placed in its new and larger container, make sure you water it thoroughly, using the same process as described above. Then, you want to keep your ficus bonsai in sunshade for two to three weeks, allowing the new root system to take hold. Figs grow easily and quickly from seeds. Besides, cuttings do very well too and would most likely be a quicker method to use when you want to achieve a larger, mature looking tree. Large cuttings can be taken from sections of a tree which exhibits good character with a high success rate. Pests– Ficus bonsai are mainly susceptible to mealy-bugs, scale, and spider mites. These can be treated by spraying the plant with fine horticultural oil, or a soap solution. You should note that Figs will not tolerate insecticides containing Malathion. Leaf Spot Fungus - also known as cercospora spp. This looks like tiny black dots on the backs of the leaves of the tree. The leaves may turn yellow and fall off. Remove the diseased leaves and spray with Benlate (follow the instructions exactly). Do not mist the leaves. Leaf Dropping - this is a fairly common phenomenon during process of ficus tree care. The tree can also be defoliated because of over-watering or incorrect position of bonsai tree. If you solve the related problems in time, your bonsai will leaf out in several weeks. See more about how to cure Ficus Dropping Leaves. Ficus oozing sap - this is a condition caused by sucking pests. This is usually caused by mealy bugs and/or scale. Mealy bugs look like small cottony clusters and scale looks like bumpy white or black spots on the stems and body of the tree. This problem can be treated with Schultz's Fungicide 3, horticultural oil or a soapy solution of 1 tablespoon of soap to 1 pint of water. Having read above tips, you see that ficus tree care is not so hard or difficult. As long as you love your passion, you’ll have beautiful ficus trees.